A friend of mine asked me how they could automatically follow and unfollow people on Twitter. But they didn’t want to follow just anyone and everyone. He had a Twitter account which they used for recruiting in a very narrow construction industry. He wanted to find people in the same industry and follow them – hoping they would follow him back and learn about his open jobs. When I joined Twitter back in 2008, I wrote a similar program to automatically follow/unfollow users, but the Twitter API has changed quite a bit since then. So I decided to re-write the program with the latest Perl-Twitter API – Net::Twitter::Lite::WithAPIv1_1. When running these types of scripts on Twitter, you have to be careful to not surpass the rate limits that Twitter has established for using the API. I have included a script named rate_limit.pl – which can give you the limits you have for each API-call, and how many calls you have remaining before the limits are reset by Twitter. I have added pauses in the scripts to help prevent you from going over the rate limits (but you will need to check to ensure you don’t surpass them). You are free to modify these scripts (but I won’t be able to help you figure out how to do this.) The rate limits may be found at https://dev.twitter.com/rest/public/rate-limiting. The key with using the Twitter API is to not be too aggressive, or your app will be banned by Twitter. For example, Twitter does not allow bulk follows and unfollows – so having patience is important. followers_find.pl – To use this script, you choose a Twitter user that has an audience similar to yours, and then follow their users. For example, if you want to follow cat lovers, you could grab the followers of the Twitter user named @Cat. This script will pull the last 5,000 followers of @Cat, and place those user ID’s into a database named follows_other_users. The script will also save the cursor information, so you can run this script multiple times to obtain a large pool of users, and avoid duplicates. This script stores the account you followed (@Cat) and the user_id of the follower. 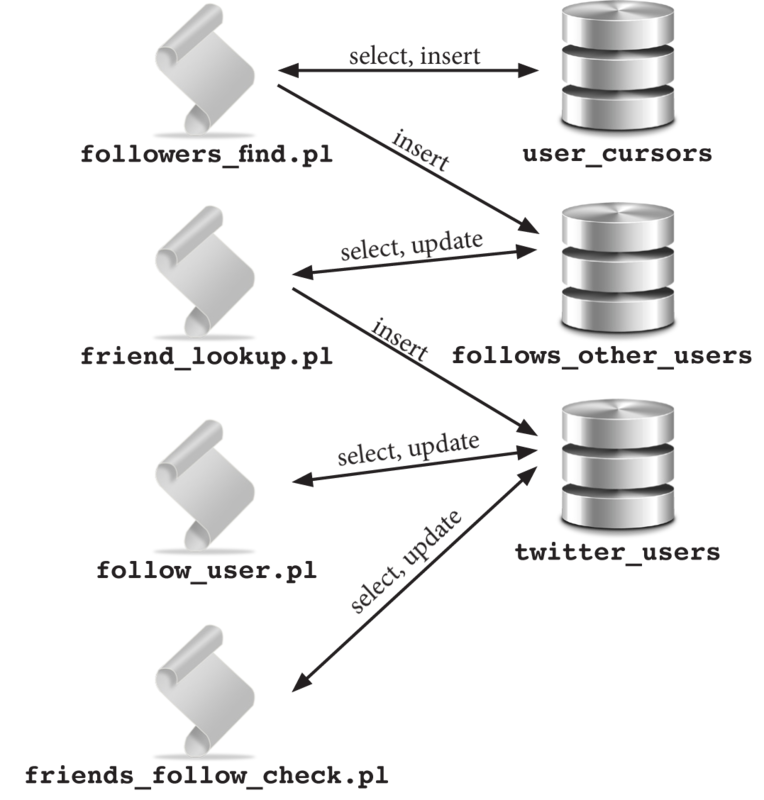 friend_lookup.pl – This script takes 100 of the user ID’s from the follows_other_users database, pulls the user’s details from Twitter and inserts this information into the twitter_users database. The user information includes the name, the user ID, number of tweets, how many followers, how many people they are following, time zone and description. You can modify the database and the script to include or omit other pieces of information. follow_user.pl – This script follows users from the twitter_users database, based upon the percentage of followers/following and the number of tweets (you can change the search criteria). For example, I didn’t want to follow someone who was following 2,000 people but only had 100 followers. I wanted the followers/following ratio to be a little more even. I also wanted to follow people who had posted at least 30 tweets. Even though the followers_find.pl script downloads the information for 5,000 users (at a time), you might only follow a couple hundred of these users who fit your criteria. friends_follow_check.pl – This script will check to see if a user you followed has followed you back, and if not, then the script will unfollow that user. You will need to specify how many days to give someone to follow you back before you unfollow them. For example: You follow a group of users on 10/05/2015 (the database stores what date you follow someone). You decide to wait five days to see if anyone from this group follows you back. Therefore, on 10/10/2015, you can run this script and change the $date_to_delete variable to 2015-10-05, and the script will unfollow anyone you followed on 2015-10-05 (or prior) who is not following you back. followers_find.pl – Use this to grab followers of a related Twitter user by providing a value for $user_to_find_followers. This value should be the Twitter user’s name without the “@” symbol – and not their description name. The script will insert 5,000 followers at a time into follows_other_users and insert cursor information in user_cursors. friend_lookup.pl – Selects users from follows_other_users, gets the user’s details, and then inserts the information into twitter_users. The script can get information on 100 users at a time. Some users may produce an error, and the script will stop. If this happens, just re-run the script. If the script still has an error, delete that user from the database. For some reason, when I ran this script, I would get an error on a particular user. I spent a lot of time trying to figure out why the error occurred, but there were too many unknowns as to why the error existed. So, when the script finds a bad user, it updates the follows_other_users database and marks that users with an error (err). You may have to delete a user from the follows_other_users if the script doesn’t automatically mark the user with an error and the script exits immediately after running it. follow_user.pl – Selects users from twitter_users database and follows them if they meet certain criteria. The script also updates the twitter_users database as to whether or not they were followed, and what date/time they were followed. This script uses the create_friend API call. The web site does not specify the limit, and the limit does not appear when you run the rate_limit.pl script. I only follow 10-20 new friends an hour – to avoid Twitter’s ban on automatic bulk follow/unfollow. The number of users to follow is set with the $limit variable, and I have it set to 250. This means the script will follow 250 users before quitting. I used a sleep command (a random-length pause between six minutes ($minimum = 360;) and twelve minutes ($maximum = 720;) between following users so Twitter doesn’t think you are a robot. You may adjust these values as well. friends_follow_check.pl – Selects users you followed from the twitter_users database and unfollows them if they haven’t followed you. It updates twitter_users with the unfollow information. After you run the follow_user.pl script, you will need to wait a few days to give people time to follow you back. You then will need to change the variable $date_to_delete to be a few days prior to the current date. I usually give people five days to follow me. You can always change your search criteria to be less restrictive, in order to find more followers. But I have found that a strict search criteria removes most of the spammers. Also, there are print statements that have been commented out as well. Uncomment them if you want to see the output. And here are the scripts. Remember you need to create your own keys and tokens and insert them into the script for $consumer_key, $consumer_secret, $access_token and $access_token_secret. The scripts are also available on GitHub – https://github.com/ScriptingMySQL/PerlFiles. # the return value is a reference to a hash with keys previous_cursor, next_cursor, and ids. # The value of ids is a reference to an array of IDS of the user's followers. # Set the optional cursor parameter to -1 to get the first page of IDs. # Set it to the prior return's value of previous_cursor or next_cursor to page forward or backwards. # When there are no prior pages, the value of previous_cursor will be 0. # When there are no subsequent pages, the value of next_cursor will be 0. # how many days do you want to wait until you unfriend someone? I am not the best Perl programmer, nor am I an expert at the Twitter API, so there may be a better/easier way to do this. Good luck with the scripts and let me know how they work for you. 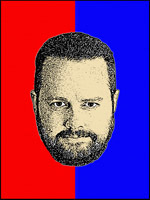 And follow me on Twitter at ScriptingMySQL and TonyDarnell. Tony Darnell is a Principal Sales Consultant for MySQL, a division of Oracle, Inc. MySQL is the world’s most popular open-source database program. Tony may be reached at info [at] ScriptingMySQL.com and on LinkedIn. 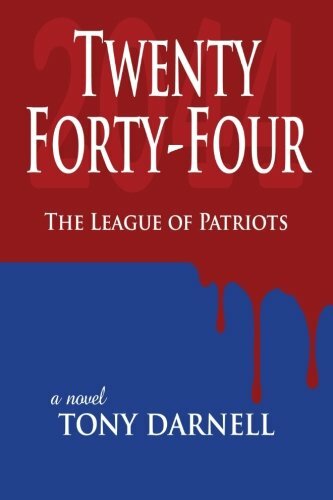 Visit http://2044thebook.com for more information.